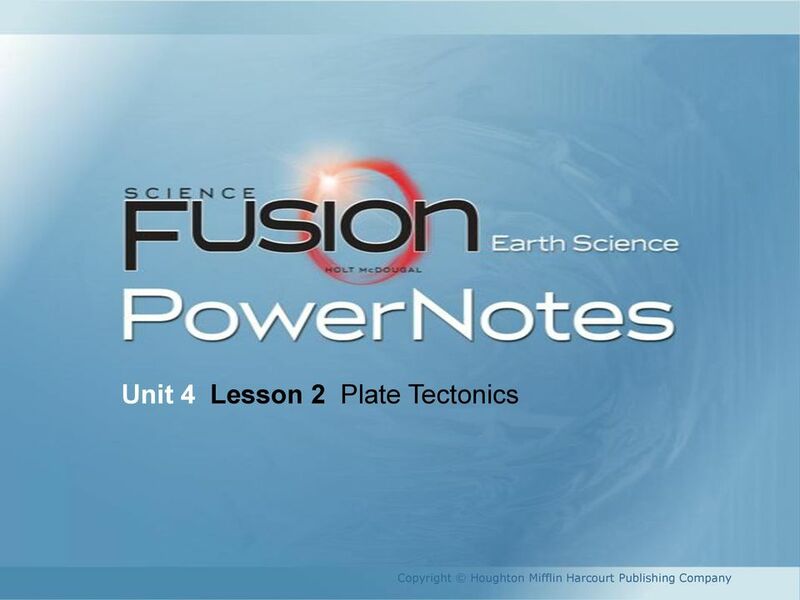 Download "Unit 4 Lesson 2 Plate Tectonics. Copyright Houghton Mifflin Harcourt Publishing Company"
2 Puzzling Evidence What evidence suggests that continents move? In the late 1800s, Alfred Wegener proposed his hypothesis of continental drift. According to this hypothesis, the continents once formed a single landmass, broke up, and drifted. 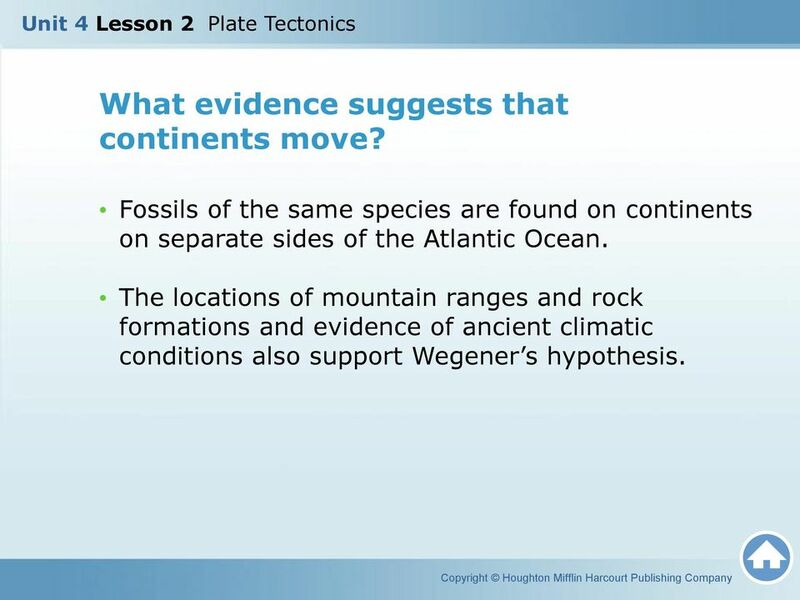 3 What evidence suggests that continents move? Fossils of the same species are found on continents on separate sides of the Atlantic Ocean. The locations of mountain ranges and rock formations and evidence of ancient climatic conditions also support Wegener s hypothesis. 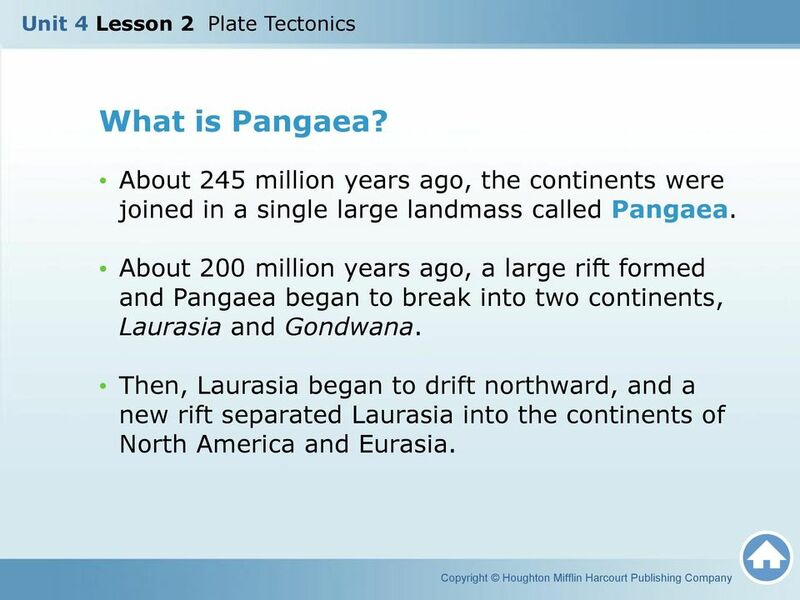 4 What is Pangaea? About 245 million years ago, the continents were joined in a single large landmass called Pangaea. About 200 million years ago, a large rift formed and Pangaea began to break into two continents, Laurasia and Gondwana. Then, Laurasia began to drift northward, and a new rift separated Laurasia into the continents of North America and Eurasia. 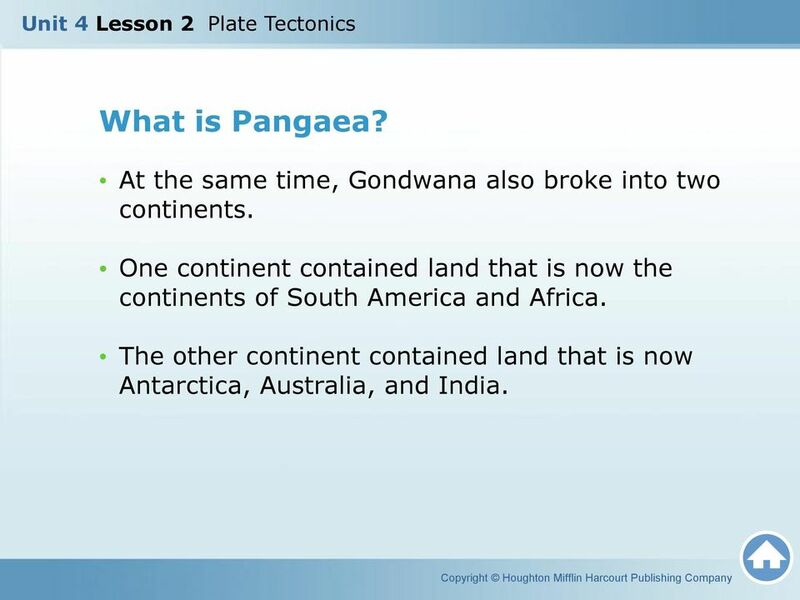 5 What is Pangaea? At the same time, Gondwana also broke into two continents. One continent contained land that is now the continents of South America and Africa. The other continent contained land that is now Antarctica, Australia, and India. 6 What discoveries support the idea of continental drift? 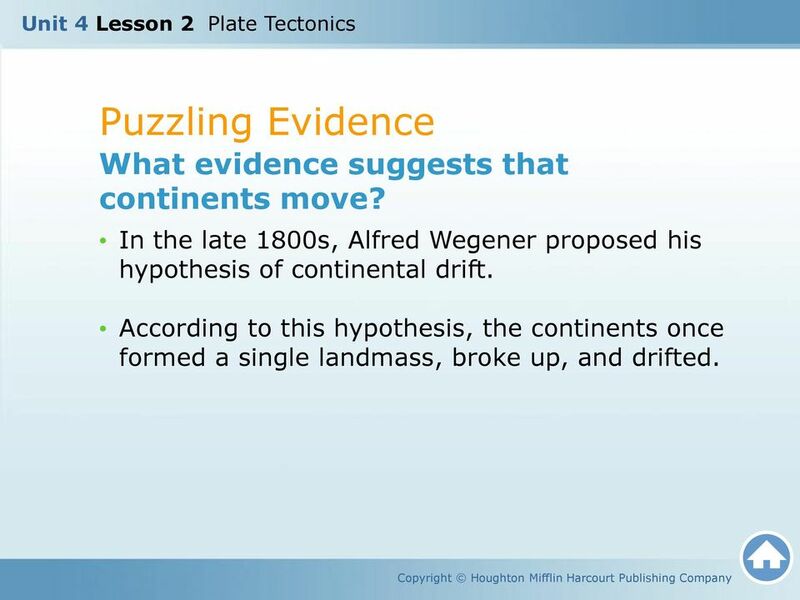 For many years, scientists did not accept Wegener s ideas because they could not determine how continents moved. In the mid-1900s, scientists began mapping the sea floor and discovered huge, underwater mountain ranges called mid-ocean ridges. 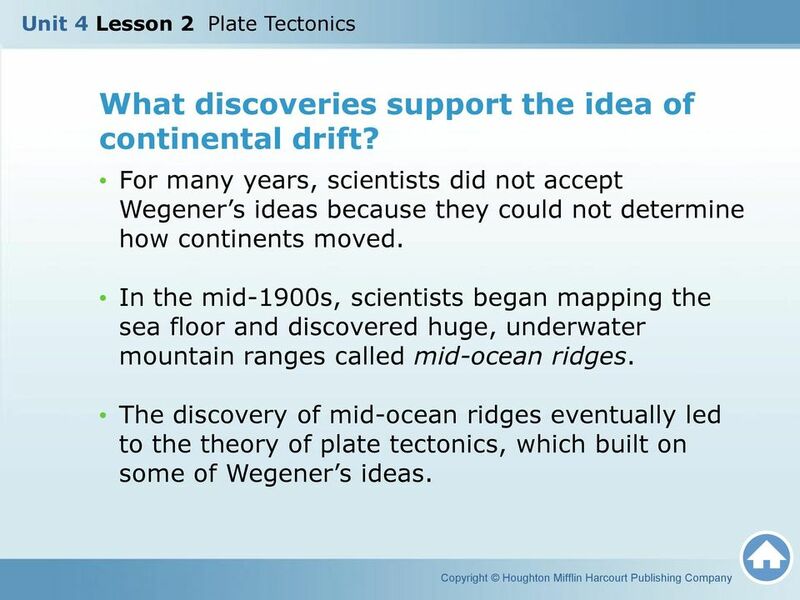 The discovery of mid-ocean ridges eventually led to the theory of plate tectonics, which built on some of Wegener s ideas. 7 What discoveries support the idea of continental drift? Rock samples from the sea floor revealed that the youngest rock is closest to the ridge, while the oldest rock is farthest away. Even the oldest oceanic crust is young compared to continental crust. Also, sea-floor rock contains magnetic patterns. 8 What discoveries support the idea of continental drift? To explain the age and magnetic patterns of seafloor rocks, scientists proposed a process called sea-floor spreading. In this process, molten rock from inside Earth rises at the ridges and forms new oceanic crust. Older crust is pushed away from the ridge, and the sea floor slowly spreads apart. 9 What discoveries support the idea of continental drift? Scientists also discovered huge trenches in the sea floor where oceanic crust sinks into the asthenosphere. Older crust is thus being destroyed at the ocean trenches at the same rate as new crust is forming at the ridges. In this manner, Earth remains the same size. 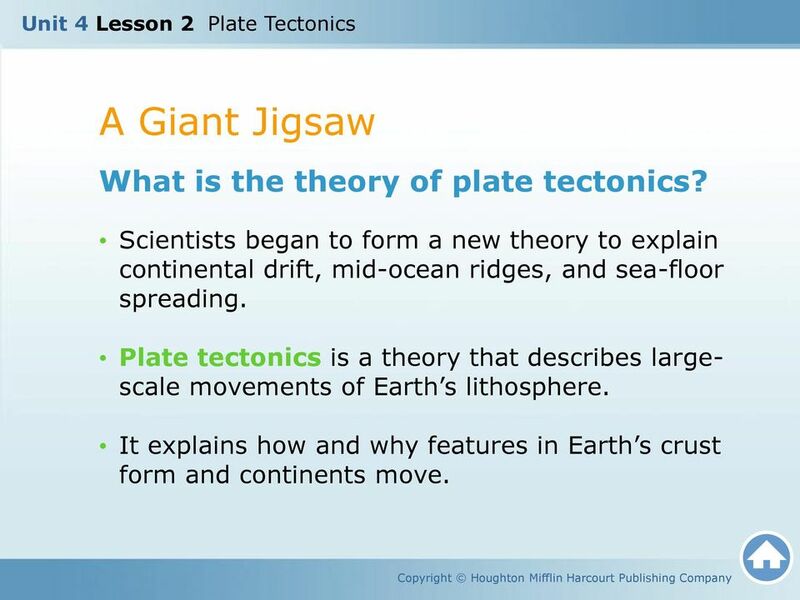 10 A Giant Jigsaw What is the theory of plate tectonics? Scientists began to form a new theory to explain continental drift, mid-ocean ridges, and sea-floor spreading. 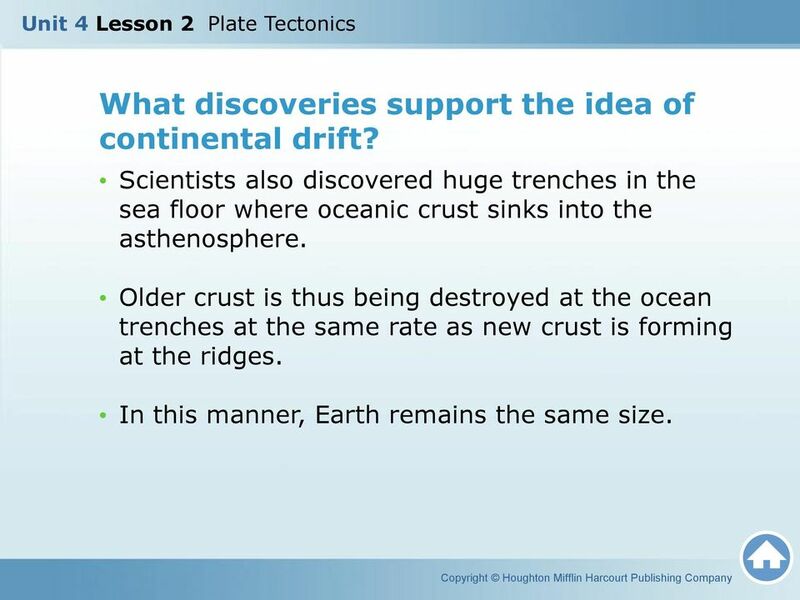 Plate tectonics is a theory that describes largescale movements of Earth s lithosphere. It explains how and why features in Earth s crust form and continents move. 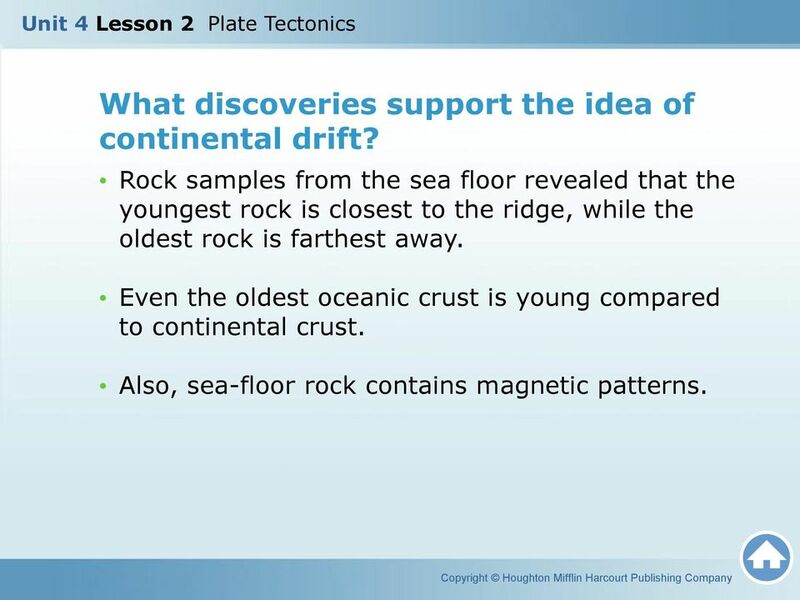 11 What is a tectonic plate? 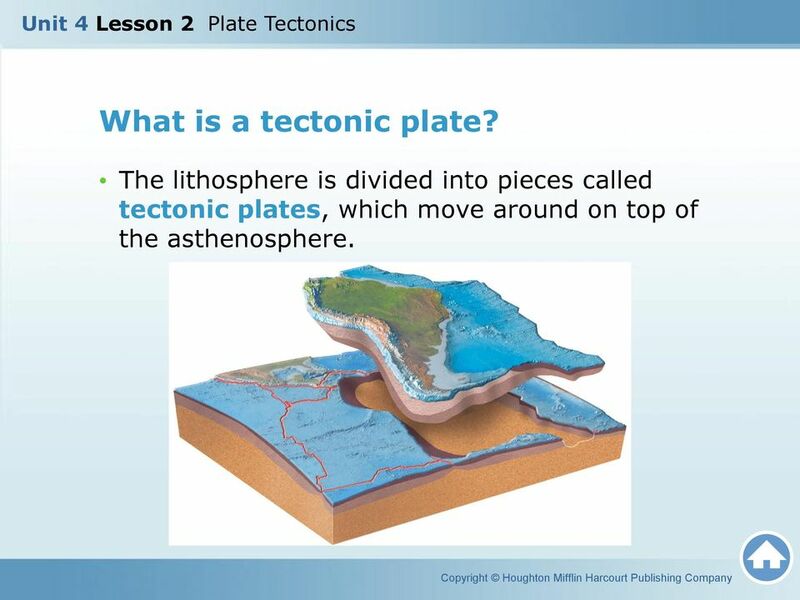 The lithosphere is divided into pieces called tectonic plates, which move around on top of the asthenosphere. 12 Boundaries What are the three types of plate boundaries? Plate boundaries may be on the ocean floor, around the edges of continents, or even within continents. 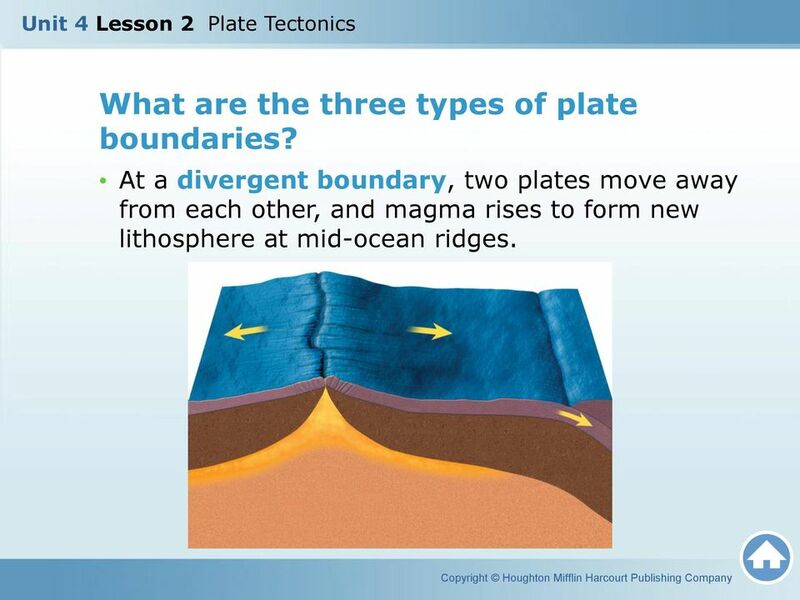 The three types of plate boundaries are convergent boundaries, divergent boundaries, and transform boundaries. Each type is associated with characteristic landforms. 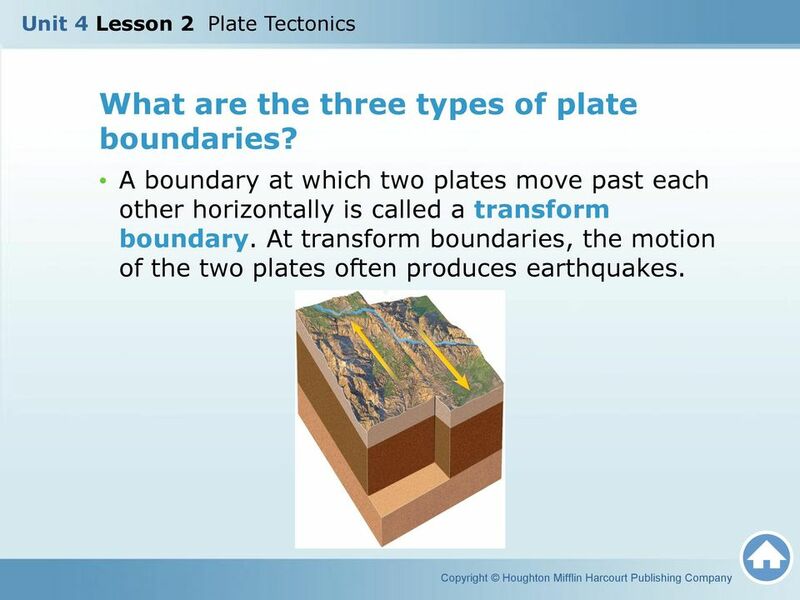 13 What are the three types of plate boundaries? Convergent boundaries form where two plates collide. This can happen in three ways, depending on the types of crust involved. 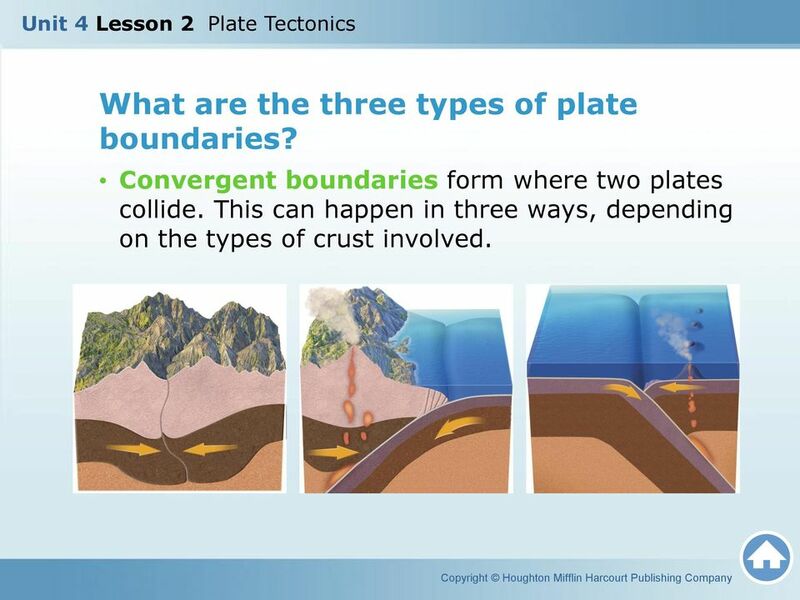 14 What are the three types of plate boundaries? At a divergent boundary, two plates move away from each other, and magma rises to form new lithosphere at mid-ocean ridges. 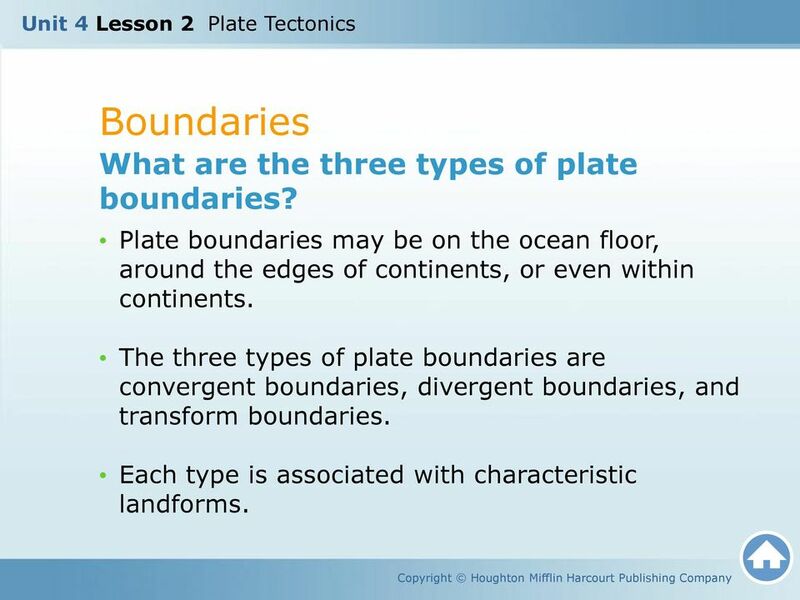 15 What are the three types of plate boundaries? A boundary at which two plates move past each other horizontally is called a transform boundary. At transform boundaries, the motion of the two plates often produces earthquakes. 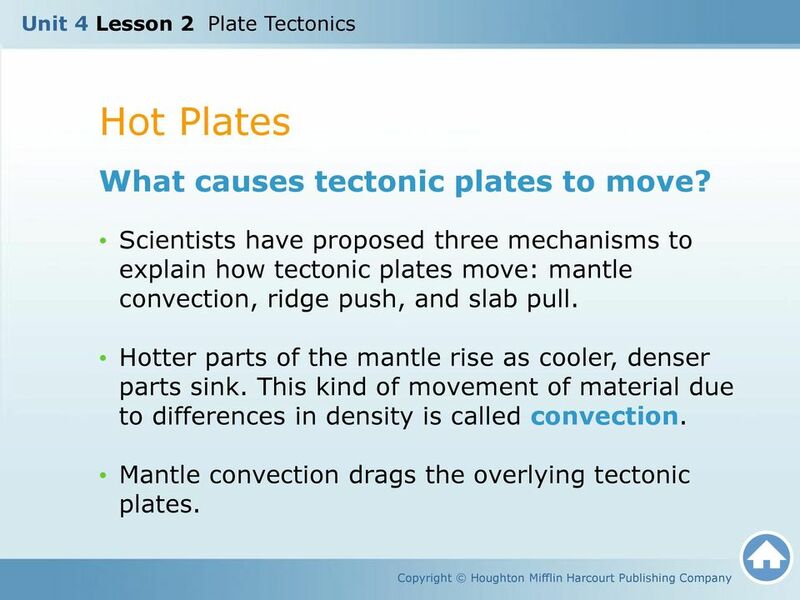 16 Hot Plates What causes tectonic plates to move? Scientists have proposed three mechanisms to explain how tectonic plates move: mantle convection, ridge push, and slab pull. Hotter parts of the mantle rise as cooler, denser parts sink. This kind of movement of material due to differences in density is called convection. Mantle convection drags the overlying tectonic plates. 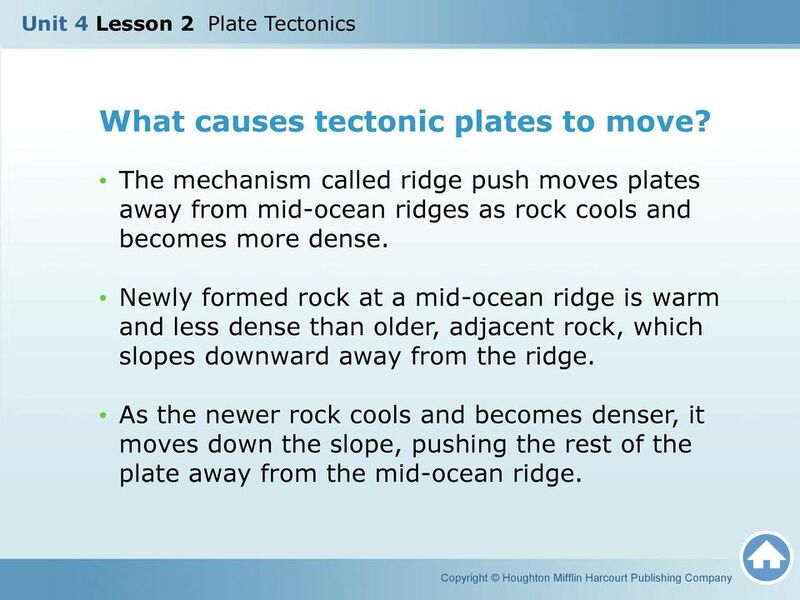 17 What causes tectonic plates to move? The mechanism called ridge push moves plates away from mid-ocean ridges as rock cools and becomes more dense. Newly formed rock at a mid-ocean ridge is warm and less dense than older, adjacent rock, which slopes downward away from the ridge. As the newer rock cools and becomes denser, it moves down the slope, pushing the rest of the plate away from the mid-ocean ridge. 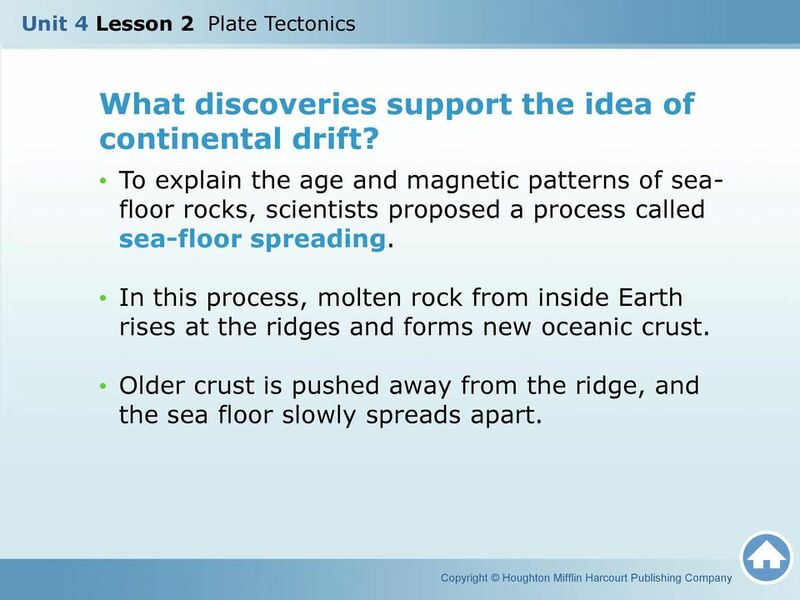 18 What causes tectonic plates to move? 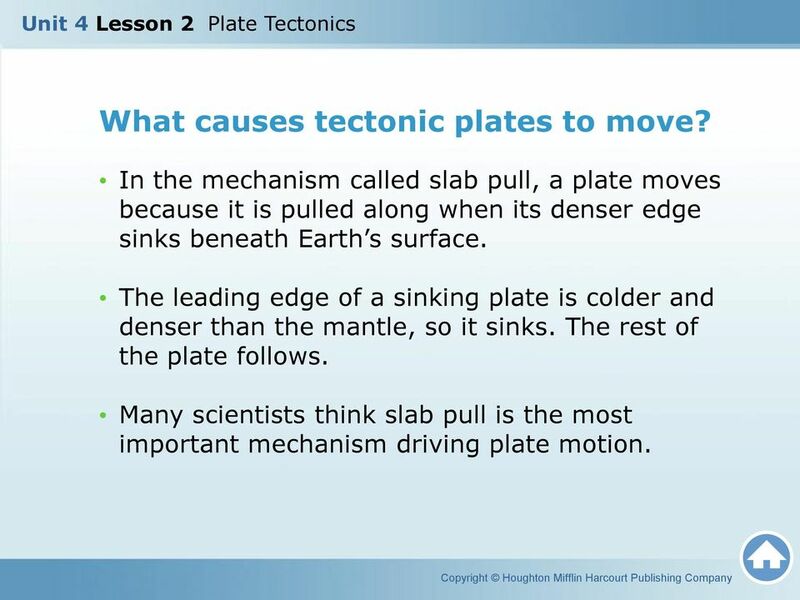 In the mechanism called slab pull, a plate moves because it is pulled along when its denser edge sinks beneath Earth s surface. The leading edge of a sinking plate is colder and denser than the mantle, so it sinks. The rest of the plate follows. Many scientists think slab pull is the most important mechanism driving plate motion.